Amelia is a medical student at the Alpert Medical School at Brown University. She is committed to disseminating science, health, and medical information to a diverse audience. LSD and other hallucinogens are typically associated with the 1960s, flower children and the Summer of Love in San Francisco, but the psychopharmacological effects of these drugs is about more than just seeing “Lucy in the Sky with Diamonds”– they can provide fascinating insight into the functionality of the brain. Lysergic acid diethylamide, better know as LSD or “acid”, was first synthesized by Dr. Albert Hofmann in 1938 who, after ingesting the substance and experiencing a psychological revelation, advocated that the drug could be used a powerful tool for studying the human mind and neurological functioning. According to a study published in Psychopharmacology, the effects of LSD and other hallucinogens are caused by the interaction of the drugs with the serotonin system in the cortex of the brain. It seems that the drugs work by activating the 5-HT2A receptors (2ARs), which are normally triggered by serotonin. These receptors have been associated with various functions including mediation of social and emotional behaviors, memory, sleep, appetite and mood. Normal functioning of the brain requires that the cerebral cortex receive and interpret signals coming from the 5-HT2A receptors as well as hundreds of other receptors in the brain for different neurotransmitters (chemicals used to carry messages throughout the brain). Our perception depends on the way in which these thousands of signals are integrated and used to create a mental model of the world. Understanding how hallucinogens affect brain function via neurotransmitters and receptors in the brain is one of the most powerful methods for discerning basic brain functions. 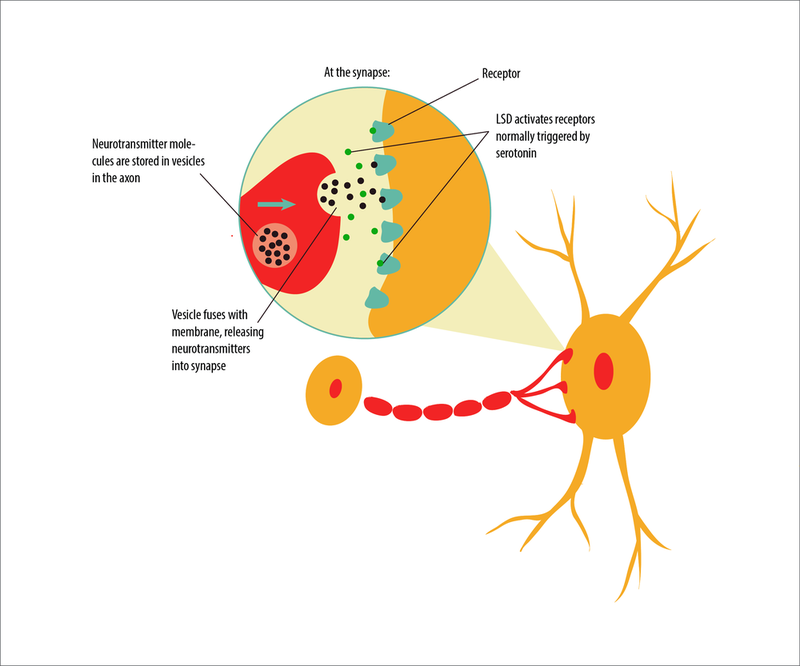 Considering how chemical manipulation of neural receptors affects our mental model of the world can lead us closer to fully understanding the origins of perception in the brain. Titeler, M., R.a. Lyon, and R.a. Glennon. “Radioligand Binding Evidence Implicates the Brain 5-HT2 Receptor as a Site of Action for LSD and Phenylisopropylamine Hallucinogens.” Psychopharmacology 94.2 (1988). Bear, Mark F., Barry W. Connors, and Michael A. Paradiso. Neuroscience: Exploring the Brain. Philadelphia, PA: Lippincott Williams & Wilkins, 2007. Harvey, J. A. “Role of the Serotonin 5-HT2A Receptor in Learning.” Learning & Memory 10.5 (2003): 355-62. Jun 20 Different Drinks, Different “Drunks”? Jun 20 Food for Thought: What Do Our Cravings Really Mean?